A super cute birthfay card for a special friend. 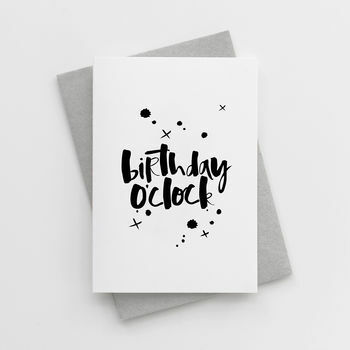 Wish someone special a very happy birthday with this super cute birthday card. Featuring our classic hand lettering, this luxury birthday card reads 'Birthday O'Clock'. This unique, contemporary and eye catching design is printed on luxurious eco friendly, textured 350gsm card and teamed with a recycled soft grey envelope.